BelarusDigest > All > Russian Elections: Déjà Vu for Belarusians? Russian Elections: Déjà Vu for Belarusians? In Russia's recent elections to the State Duma the ruling United Russia party won. The Russian opposition claims that the authorities falsified the results in favour of Putin's party. Similar to Belarusian authorities, the Kremlin put pressure on independent observers, falsified the results to a certain degree and temporarily blocked independent sources of information. But overall the Russian elections and handling of post-election protests were much more democratic than in Belarus. What kind of changes will these elections bring to Russian politics and what consequences will they have for Belarus? Although the elections and post-election protests were an important political development for Russia itself, they will not be a game changer for Belarus-Russia relations. 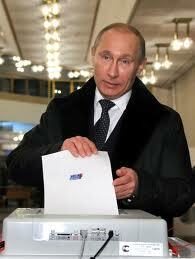 However, Russia's policy towards Belarus may change following presidential elections in 2012. Various observers note that despite quite convincing victory as provided by Western standards, United Russia lost a big percentage of support among the population as well as the absolute majority needed to adopt federal constitutional laws. According only to official data, the United Russia's vote share decreased by 15% in comparison with previous elections. United Russia enjoys the widest popularity in the North Caucasian republics – for example, in Chechnya it was supported by 99.51% of voters. Such facts pave the way for public speculation about massive electoral fraud, as it is hardly possible to achieve such a result without falsifications. Russian president Dmitry Medvedev headed the ruling party’s list during the elections and it seems that this helped United Russia to obtain 238 out of 450 seats. At the same time the Russian communist party wo 92 seats (19.2% of votes), Just Russia – 64 seats (13.25% of votes) and the Liberal Democratic Party with its irremovable leader Vladimir Zhirinovsky – 56 seats (12% of votes). It should be mentioned that there is still no sufficiently large right-centrist party in Russia, where the middle class represents a big part of the population and there is a growing demand for changes among the people. The so-called Liberal-Democratic Party actually tends to favor nationalist positions. An attempt to create the Right Cause party with aluminum and nickel tycoon Mikhail Prokhorov as its head came to a grievious end for its leader who was forced to resign amindst scandal in September. The party suffered a crushing defeat subsequently in the elections, and nowadays its new leader Andrey Dunaev is seriously considering the option of emigration. Therefore, the State Duma will not represent a huge part of the Russian population with liberal views and it undermines the legitimacy of the legislative body. The main ideologist of United Russia, deputy head of the presidential administration Vladislav Surkov paid attention to this fact just after the elections, stating that Russia needs a new party of “irritated urban communities”. The election results clearly demonstrate that United Russia should move to make compromises and become more liberal although they will not significantly change the political spectrum represented in the Duma. If it does not change, it will increase the gap between the ruling elite and ordinary people. Citizens of big cities, especially Moscow and Saint Petersburg, are tired of the same faces in power for such extended periods of time and they actively expressed their voiced their opinions in the most recent elections. Russian elections were similar to Belarusian electoral campaigns in many ways: the same pressure on independent observers (“Golos” organization), the same means of electoral falsifications (frauds with absentee ballots, fabricating results, throwing additional ballots in ballot boxes), preventive detentions (Sergey Udaltsov), mass protest actions followed by the arrests of opposition leaders (Ilya Yashin, Alexey Navalny, Sergey Mitrokhin) and the blocking of independent sources of information (Ekho Moskvy radiostation site, “Big City” journal and Livejournal). Nevertheless, elections were more democratic than in Belarus. There was no pressure on independent observers in the majority of voting stations, and opposition leaders could openly express their opinion in mass media and Parliament without any intervention from state authorities. This included well-known debates between Vladimir Zhirinovsky and Alexander Khinshtein, when Zhirinovsky harshly criticized United Russia, not troubling himself to be too careful with his choice of words. What are the Implications for Belarus? The Communist Party has strengthened its positions as a result of the elections. It traditionally advocates the interests of the Belarusian regime in Russia and personally Alyaksander Lukashenka. In its election program the party promises to defend Belarus from “Russian oligarchs”. It could mean a potential increase in the influence of the Belarusian lobby in Moscow. However, this election is incapable of considerably altering the state of relations between Belarus and Russia. At the same time the importance of the Eurasian Union project may rise in importance in order to show the effectiveness of the Russian authorities' foreign policy, given a sharp fall in public trust in the ruling elite. It creates favourable conditions for Belarus in the framework of cooperation with Russia and it means that Russia will close its eyes to various controversial events that take place in its neighbouring state. Particularly, one should not wait for new video appeals of the Russian president to revive the investigation of notorious political disappearances in Belarus. Russian presidential elections will have crucial importance for the future of this country with prime minister Vladimir Putin as the main candidate. It is hard to define what will be his level of support given mass demonstrations in Moscow and his native town of Saint-Petersburg. Today there are proposals in mass media to nominate a single opposition candidate – communist leader Gennady Zyuganov or blogger Alexey Navalny. One will be able to define Putin’s true intentions towards the Eurasian Union and the level of Russia’s willingness to pay for further integration only after the 2012 presidential elections in Russia. Then the Russian authorities will finalize their domestic and foreign policy for a middle-term perspective (5-6 years). The dynamics of Belarusian-Russian relations depends exactly on these two issues that can either promote or undermine the European ambitions of Belarus. It may be that following the presidential elections, the Russian authorities will increase the pressure on Belarus again to obtain its remaining assets in the absence of any competition from the West. Despite unfavourable environment, Belarusian NGOs continue to launch various initiatives and campaigns in Belarus. Most of initiatives relate to education, human rights and social issues. However, conferences on political issues have to take place outside of the country – in Vilnius and Brussels because often authorities prevent them from taking place in Belarus. US Secretary of State meets with Belarusian civil society delegation. United States Secretary of State Hillary Clinton met with a delegation of Belarusian civil society in Vilnius on December 06, on the sidelines of a meeting of the Organization for Security and Cooperation in Europe. Ms Clinton said that the United States and the European Union would fight Lukashenka's regime through sanctions and travel bans. Civil Society Conference in Vilnius. On December 04-05, Vilnius hosted the Civil Society Conference held in parallel with the 18th session of the OSCE Ministerial Council. The OSCE Civil Society Parallel Conference adopted a Resolution "On Reaction of the OSCE and the International Community to Human Rights Crisis in the Republic of Belarus". In particular, the resolution urges the international community to stop all cooperation with the authorities of Belarus that provides for the transfer of funds to the Belarusian authorities either directly or through companies their control. The document also suggests discussing the prospects of suspending the voting rights of the representatives of Belarus authorities and even suspending the membership of Belarus in the OSCE. Public Bologna Committee established. The expert community and a number of NGOs have decided to establish a Public Bologna Committee on the basis of National Platform of Eastern Partnership CSF. The Committee's aim is to develop "road map" of integration of the Belarusian higher education in the Bologna process. On December 13, the Committee's founders will hold a press conference on the integration of the Belarusian higher education in the Bologna process. Video and Talk Show about Social Contracting. Promoting the mechanism of state funding of NGOs, ACT has released a video about the state social contracting and a talk-show "Social Partnership" produced by Gomel TV. Activities are supported by the Global Fund to Fight AIDS, Tuberculosis and Malaria. BRCS Initiates a Law on Volunteering. Belarusian Red Cross Society (BRCS) which conducts a significant work with volunteers initiates the development of a draft law on volunteering. Earlier a bill on volunteering was prepared and introduced to the Parliament, but it wasn’t adopted. A new attempt to draft a bill is scheduled for 2012. New Campaign “1%”. International foundation "Idea" is launching a public campaign "Project "1%". The campaign aims to enact a law on charity and making changes and additions to the Tax Code of Belarus, namely to develop a "rule of one percent." Manual on New Media. The new manual is the result of the 2-year Belarusian-German project, in which 10 Belarusian NGOs took part. They learned to shoot video, work with Google program resources, use social networks in order to increase NGOs’ capacity. "Human rights activists against the death penalty". It was announed at a joint press conference of human rights activists on December 9 in Minsk that more than 165,000 petitions for the abolition of the death penalty in Belarus were sent to the Presidential Administration by mail. Winners in the field of human rights. On December 13, human rights NGOs will announce the names of a journalist, a human rights activist and a lawyer, which have gained exceptional achievements in the field of human rights in 2011. The competition was established by Human Rights Alliance. The fourth BCD attempt to register. On December 17, in Minsk party "Belarusian Christian Democracy" will hold the fourth founding congress. Since 2009, for three times BCD held the founding congress and filed registration documents to the Ministry of Justice, but so far the state registration has not been received yet. Coalition of “Six”. Belarusian Popular Front, United Civic Party, “Fair World” Party, Belarusian Christian Democracy, the Movement "For Freedom" and the campaign "Tell the Truth" – Coalition of the “Six” – will participate in the Parliamentary elections in 2012, but they have not yet defined the format of participation. BISS vacancies. Belarusian Institute for Strategic Studies announces new vacancies of an analyst and a public relations specialist. The deadline for applications is December 20.